It’s hard to believe it’s been almost two years since the Barack Obama administration came to an end. We’re not here to play politics, but we do think government is super fascinating. That’s what we’re excited to hear from Barack’s right-hand man, Joe Biden, when he visits Missoula in December! 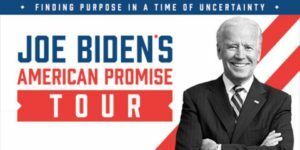 Yep, ol’ Joe will bring his “American Promise Tour” to the Dennison Theatre on Monday, December 3rd – a chance to hear a little bit about his early life as well as the 45-plus years he spent in public office – including 36 as a U.S. Senator from Vermont and eight as Vice President. Biden’s story, which is recounted in a new memoir – Promise Me, Dad: A Year of Hope, Hardship, and Purpose – is much more than a political one, however. The former Veep is also expected to talk about his experiences as a father, grandfather, husband and friend as he confronts devastating personal loss while trying to balance duties to family and country. Tickets for Biden’s speech in Missoula range from $60 to $110 and include a paperback copy of his new memoir. We’re offering up a special presale for folks who wanna secure theirs early. Just VISIT THIS LINK and enter presale code “MISSOULAJOE” to snag your pair now. Otherwise, they’ll be up for regular sale 10am this Friday morning at the Adams Center Box Office, by calling (406) 243-4051 or online at GrizTix.com. Orrr … how about you win a pair from yours truly? Just follow this link and enter your info and we’ll pick a winner at random on Friday, Nov. 30!